IDEA StatiCa | When a “simple” steel connection is actually not so simple! 18 Jun When a “simple” steel connection is actually not so simple! Since the first launch of IDEA StatiCa 4 years ago, it became very clear that this new technology was about to revolutionize the way that structural engineers design steel connections, since it was (and is) the only software in the world that provides total freedom in the topology and loading of the joint. As a result, structural engineers around the world started to use it to design very easily connections that until now were a total nightmare and incredibly time-consuming, achieving a very high level of productivity and safety. Even more than that, IDEA StatiCa allowed a structural engineer to investigate different design alternatives very easily and come up with the most economical and safe solution. 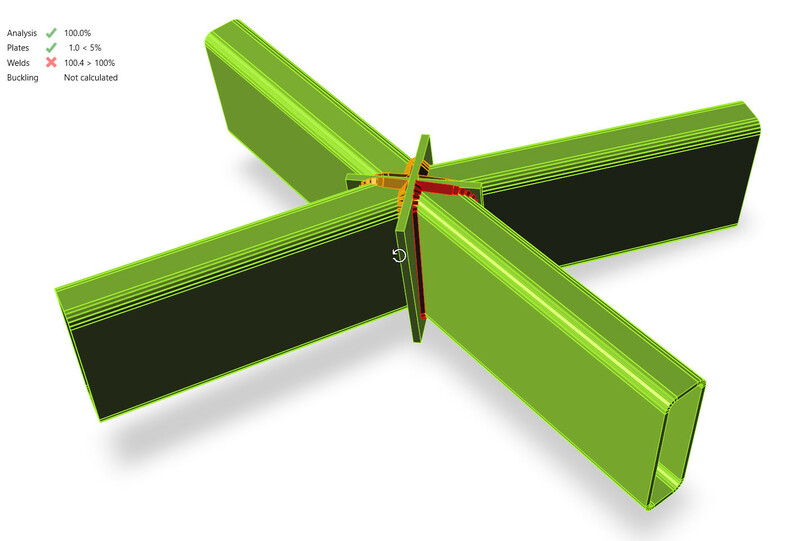 Because of this flexibility and ability to design even the most complex connection, IDEA StatiCa is often considered by engineers, as a tool mainly for complex connections with many members, loading and complex plates shapes. In this article I wanted to show through a couple of cases from customers, that IDEA StatiCa can be extremely useful even for “common” connections that are used in modern structures, that although seem simple, they are practically impossible to check with any of the existing connection design software tools in the market. In the following picture you can see a welded spaceframe connection made of 4 RHS members – part of diagrid dome – where the members are welded together through 2 cross-shaped plates (division plates). This type of configuration – which don’t seem to be a ‘complex’ connection – is obviously not covered by the Eurocode, and requires ‘hand’ calculations and several assumptions to be made. Considering that the dome is consisted of around 300 similar connections, it is very easy to understand the productivity gains and the savings that can be achieved by using IDEA StatiCa in this project. Even more, the member angles which are not perpendicular to the plates, creates an additional difficulty to this project. This connection from one of our customers, demonstrates how 3 different cross section types (UB, RHS & UNP) connected through a custom shaped gusset plate, can easily make this connection non-designable by any of the standard connection software in the market, simply because this type of configuration is not covered by the design codes. So, what it seems to be a very simple multiplanar configuration, requires again some hand calculations and assumptions to be made. With the general approach of IDEA StatiCa based on the CBFEM method, the limitations of the Component method are bypassed, and we are able to check all elements of the connection (plates, bolts and welds) according to the code within minutes! In addition to the standard stress/strain analysis that is used for the check of all the elements, when the structure is susceptible to buckling, we must make sure that it can reach its maximum load without losing stability (as stated in EN 1993-1-5). 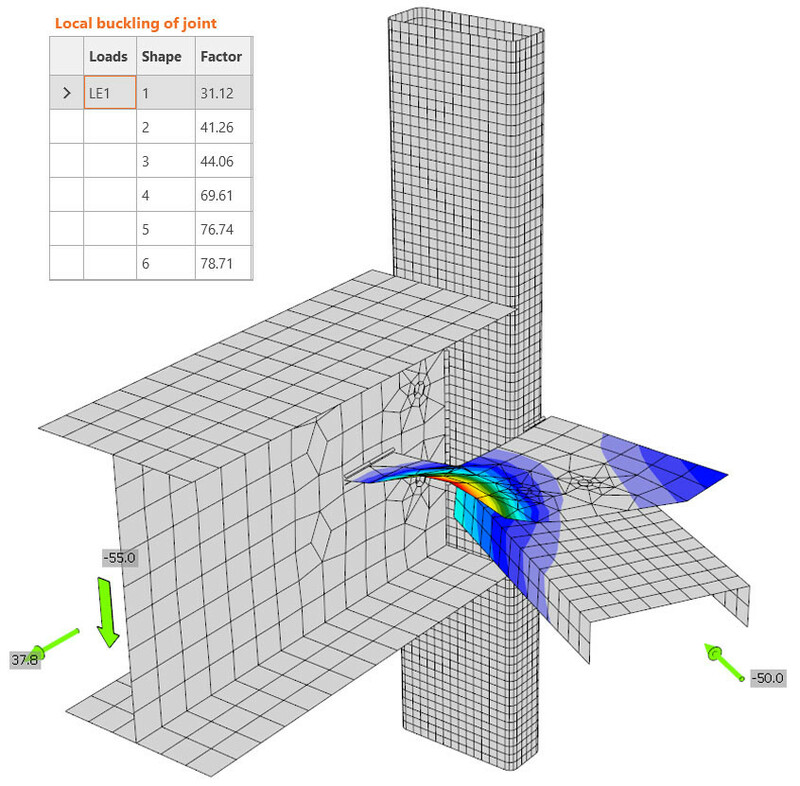 IDEA StatiCa handles very well this need and allows the user to perform a linear buckling analysis and calculate the buckling factors. It is important here to distinguish between global buckling (buckling of whole members) and local buckling (buckling of individual plates). In the case of global buckling (the plate is an extension of a member), it is necessary to check that the critical factor is larger than 15. For the cases of local buckling we need to check that the critical factor is higher than 3, otherwise the connection is succetible to buckling. Of course, this article only ‘scratches the surface’ as it is very difficult to cover all the different aspects and advantages of IDEA StatiCa, but through these 2 simple examples I hope that it becomes clearer what this new technology can bring to the practicing engineer, and the necessity of its use even with very simple joint configurations. This extra level of comprehensiveness and deep understanding of a steel connection’s real behaviour provides the engineer a great deal of safety, not to mention the productivity and provided services gains.